A brand new Jordan 7 gets that “remastered” treatment. 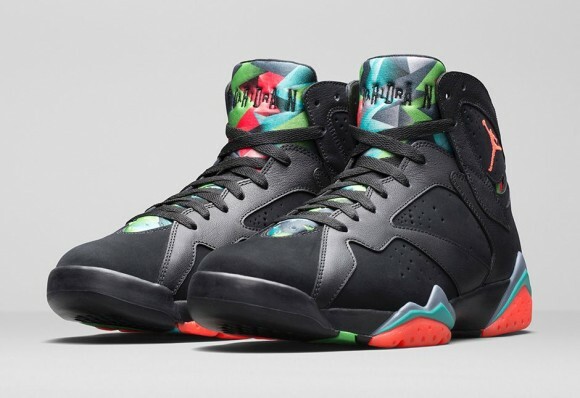 Formerly known as the ‘Marvin the Martian,’ then the ‘Barcelona Nights,’ these Jordan 7s are quite the colorway. The mixture of different colors on the Air Jordan 7 is the norm, but these take it to a whole new level! Looking almost like a prism, the hits of Infrared23 and Blue Graphite against the black upper makes these 7s pop. Not to mention the “remastered” quality, which will bring this sneaker up a notch. Something I am looking forward to is the nubuck/leather combination, which proves to give the shoe a nice contrast. If you are like me, and think that this colorway compliments the silhouette nicely, then look forward to copping these tomorrow, Saturday, March 7 for the Remastered price of $190 Try your luck online with the links below!